by Kevin M White and Gordon Davisson. Mountain Lion (Mac OS 10.8) has matured remarkably quickly. As has now become the norm, printed guides, tutorials, reference books and introductions of all sorts have appeared equally speedily in the months following Mountain Lion’s release. Indeed, we have already reviewed Galen Gruman’s “Bible” (Wiley). Most of these titles reflect the fact that, good and stable though it is, Mountain Lion has few startling or groundbreaking aspects. It hardly contains enough new features to fill a substantial book of its own. So it is with this Mountain Lion volume in the Apple Pro Training Series, OS X Support Essentials, by Kevin M White and Gordon Davisson. As has become standard for titles of this weight and authority (the Apple Pro Training Series is justly widely respected), it’s divided into broad sections – nine in this case. Each has between two and five chapters, or “Lessons”. These vary in length from half a dozen pages (the “About this guide” one at the start) to 50 (two very thorough explorations of networks). Other longer lessons cover application installation, configuration and troubleshooting. There’s hardly an area of Mountain Lion use that’s not covered in OS X Support Essentials: over a fifth (22%) of the substantive content of the book is devoted to networks (configuration and services); 15% to installing and configuring Mountain Lion itself; 17% to its applications and processes; 12% to file systems; just over 10% to each of user accounts and data management; 8% to peripherals, including printing; and 4% (fully 32 pages) of the book is addresses system startup. It’s obvious from this breakdown that the book is written for – and from the eventual standpoint of – someone who wants to be in full control of Mountain Lion; someone who wants (or needs) to “get their hands dirty” in administering it – typically for others, using a network. Here the book’s greatest strengths lie, rather than a step-by-step guide to, say, managing Safari bookmarks or choosing graphics manipulation software. Nevertheless, specific corners of 10.8 are looked into. Especially where these are likely to be of real interest to users and administrators… parental controls in Safari and Postscript fonts, for instance. Even a quick glance at the index shows that literally hundreds of topics are covered. This is what such a book needs in order to be a comprehensive “first stop” (it’s longer than its predecessor at well over 800 pages). Even better when you know that each of these many topics is explained and dealt with as well as White and Davisson do here. This book aims to produce expert users – by dealing with such advanced topics as WPA versions and configuration, the Apple Double File (forks) format, kernel extension handling. Yet it assumes little more familiarity with the OS than a “general user” would have. The resultant challenges are that it miss nothing, lead logically from the simple (sub-)concepts to the complex, and never overstay its welcome on the way. The authors arrive at the compromise very well. Often with persuasive visual aids. The section on storage, for example, starts with the assertion, “…any storage technology is nothing more than a big empty bucket of ones and zeros…”. It ends by providing the reader not only with a really clear exposition of partition schemes and volume formats; but, further, how to employ, manipulate and troubleshoot these in practice and in situ under circumstances that really are encountered often. They do this by employing a judicious mixture of physical and concrete metaphors, lucid prose and illustrated allusion to what to expect on screen when running both routine and one-time operations. The format, then, is of a series of lessons. Fortunately for those who find this linear approach constricting (because you are only meant to understand and be competent with one step when you have completed previous ones), the material is all presented in “Reference” sections first… the “exercises” can be skimmed or skipped. Those readers who do follow the instructions and work through the tutorials, though, will find explanations clear, unambiguous and excellently illustrated. For those aiming to gain Apple Certification, the exercises are – of course – recommended. There are lesson review questions and additional resources online. These supplement and satisfy official certification requirements; as well as aid independent users. The underlying methodology is designed to allow experienced users of OS X to become experts – particularly as administrators supporting other users. Specifically, OS X Support Essentials exposes the workings of OS X; explains when and how to use diagnostic and “repair” procedures, software, tools and resources; and walks through troubleshooting scenarios in detail. So it’s obvious that this book lies at the other end of the spectrum from the likes of the “Visual Quickstart” and “Dummies” series. That is not to say that complete familiarity with all every-day aspects of OS X use is assumed… you are taught such basics as the horizontal division of objects in the Dock and Spotlight searching, for example. Core OS functionality is also explained extremely well… use, setup and configuration of Time Machine has 24 pages, the Activity Monitor four, for example. At the same time, such specialist areas as proxy services for SOCKS, securely erasing Solid State Disks and the Address Resolution Protocol are handled well too. As outlined, this book should be considered as a guide to OSX, almost regardless of version. Indeed, it only has a couple of pages devoted to Mountain Lion-specific innovations; although the authors allude to 200 of them, directing readers to the Apple source. Having said that, the book is written to build upon and exploit the tighter integration with third party standards and systems (such as iCloud, Twitter) and – of course – its closeness to iOS (Notification Center, Reminders etc). At the same time, the book is current – with coverage of Thunderbolt, Messages protocols, Power Nap Mode and recent new iCloud features. The book uses the conventions of typeface and layout in the interests of easy learning… “Tips”, notes, tables, indented lists and so on. Required resources for any one exercise are clearly delineated by tinted boxes. It’s a joy to work through such a well-designed book. The index – at over 30 pages – is a good one, has been well proofed and makes location of topics in the lesson format described above easy and swift. The book is attractively laid out with plenty of white space, clear and highly legible diagrams and screenshots; that’s not always easy to achieve with the necessary multiple items of information in a book that’s little more than 9 x 7 inches. 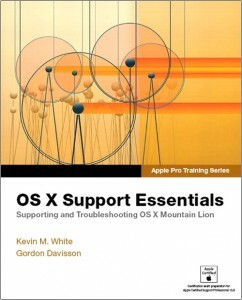 OS X Support Essentials is perhaps the first book of those now available to which specialists should turn for in depth explanations and suggestions for using Apple’s latest operating system, Mountain Lion (10.8). And indeed to understand the way other recent iterations (particularly 10.7) work too. The basic assumptions and methodology on and with which OS X Support Essentials has been written are sound and actively foster understanding. Its coverage is broad. And it’s a coverage that oozes articulacy, clarity and an awareness of the likely pitfalls that readers will encounter. Explanations are transparent, accessible and uniformly well contextualized. The material dealt with is as extensive as the features that Mountain Lion offers – almost. So the job which OS X Support Essentials does of making it all accessible, cross-referenced and easy to find, use and follow is a particularly good one. Add to this the authors’ relaxed (yet pithy) and communicative writing style; and the book’s high standards of production. It can be recommended without hesitation.